Tuvan department of the All-Russian Party "Yedinaya Rossia" ("United Russia") has discussed a prospect of the railway to Tuva. Majority of its members support this project, reported Albert Khomushku, press-secretary of the party. "Yedinaya Rossia" is considered a party of power, and it is not for nothing that this report has appeared on the official site of the Tuvan Government. Tuvan authorities are wholly pro this project lobbied by a financial group close to Sergei Pugachiov, a Russian oligarch and a senator representing Tuva in the higher chamber of the Russian Parliament. Today the first nomadiv festival opens in Ulan-Ude, capital of Buryatia. Theatres of the Russian regions, which made part in the past of the Chingiskhan's empire - Tuva, Kalmykia, Yakutia, Altai, Khakassia, Buryatia and foreign guests - from Mongolia, Inner Mongolia (China). Tuvan theatre will present there a play "Who are you, Subudai?" telling a story of a Chingiskhan's warrior Subudai, who was of the Tuvan origin. A military man from Tuva serving in Tomsk (Siberia) was reported to shot an officer and to commit a suicide. A day later a press-man from the the Ministry of Defence of Russia specified in an interview that it was done during a shooting session by accident not on purpose as the press reported earlier. Tuvan Surgeon Vyacheslav Ondar has been elected an associate member of the Russian Academy of Medical and Technical Sciences. Diploma certifying this high acknowledgement of his achievments was presented to him today in the Moscow Academy. Ondar after graduating from the Krasnoyarsk medical Institute had been working in the Tuvan Traumatic Surgery for 14 years. He was the first in Tuva to start micro-surgery saving dozens of people from losing fingers, arms, feet. A week, devoted to Tuva, was held in an elementary school in Mordelles (France) within the framework of the geography lessons. It was initiated by Martine Eleouet, teacher of 8-years old children. As she explains to Tuva-Online, throughout these lessons children will get acquainted with such an extraordinary place as Tuva, its geographic position, climatic conditions, its people and culture. 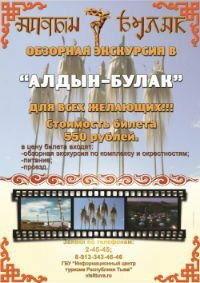 Saha Theatre (Yakutia) named after Oyunskii will tour in Tuva in November, 17-21, director of the Saha theatre Anatoli Nikolayev reported at the press-conference in Kyzyl. The yakuts will bring to Tuva three plays - 'Aspired Bank' staged on the novel by Chingis Aitmatov, famous Kirgiz writer; 'Olonkho' epos and 'Macbeth'. The last one was awarded with the most prestigeous Russian theatre prize - 'Golden Mask' in May, 2005. The culturally rich sound of throat singers is rarely heard in the United States, but it will be heard in Half Moon Bay this week, announces 'Half Moon Bay Review'. On Wednesday evening, Oct. 26, a handful of the members of Chirgilchin, a group of musicians from Tuva, will perform their haunting, mesmerizing music at the venue of Coastal Repertory Theatre. A law introducing a new system of the financial support for the local mass-media from the republican budget was adopted yesterday at the plenary session of the Legislative Chamber of the Great Khural. 18 deputies voted for the new law which a month ago could not gather the required 17 votes. A large scale exhibition devoted to the finds from the Scythian burial mounds in Altai, Tuva, Khakassia, Kazakhstan, Ukraine, Romania, North Iran will open in Germany in January, 2007, as Alexandr Brokert, vice-prime-minister of Tuva reported to Tuva-Online. It will be placed in the Martin-Gropius-Bau Museum of the former arts and crafts in Berlin and then throughout the year will move to Frankfurt, Munchen, Hamburg. The average living minimum in Tuva for the III quarter of 2005 stands at a monthly 3069 rbl per capita (appr 100 dollars), for working people - 3289 rbl, for pensioners - 2325, for children - 2973 rbl.